The RCM-070 now features hard plastic buttons rather than the older rubber buttons, since this change buttons are more responsive and easier to use. They also match their wired control modules. A wireless Rako system featuring the RCM070 is equally suited to retrofit projects and new installations. Rako's Rakom RF wireless technology and battery power operation remove the need for additional control wiring needed for many other lighting systems. The wireless RCM 070 control panel fits in a standard UK single back box (UPVC recommended). The panel has addressing switches on the back to setup rooms and houses. 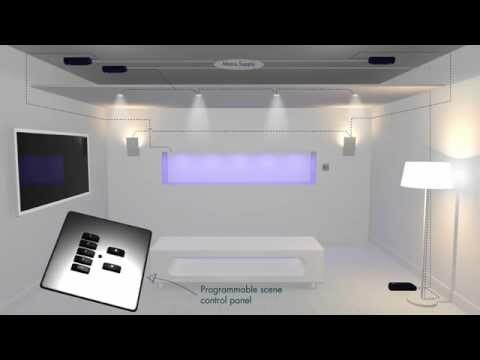 Setting two panels with the same addresses allows two way control within a room. As these panels are selecting scenes stored within the dimmers having more panels does not give more scenes. Rako's RCM-070 is a seven button wireless control module, their wireless switches replace your conventional switch and communicates wirelessly with any Rako dimmers or modules in the house. The Rako wireless system is ideal for retrofit projects, no data or power cabling is necessary thanks to Rakom coded radio transmission. The RCM070 is preconfigured for selecting four scenes, off and master raise and lower. One of the best aspects of Rako's wall plate controllers is their versatility. They can be flush mounted into UK backboxes or surface mounted on a pattress, while a wide range of finishing plates provide options such as screwless or flat, brass or stainless steel. These wireless control modules are battery powered but don't worry about replacing the batteries constantly - the batteries will last up to five years, when they need to be changed a blinking LED will warn you and changing the batteries is a quick and easy task. We've installed countless numbers of these in our own jobs and even in our own homes, and to date we've had zero failures. The wireless Rako range is easy to install, versatile and above all - reliable! Unless a faceplate is included with a Rako keypad, you'll need to order a faceplate to go with your keypad. This screwless option gives a clean, modern finish.